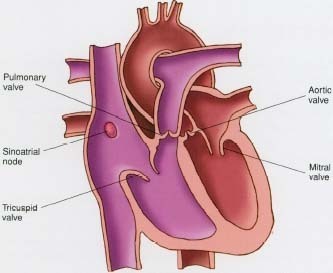 A heart murmur is an extra sound heard during a heartbeat that is caused by turbulence in blood flow through the heart. Most heart murmurs are innocent, which means they do not cause health problems and may disappear with age. But some heart murmurs require medical treatment because they are a sign of a problem in the heart's walls, lining, or valves, or are indications of other diseases or conditions. Jill's baby wiggled as the doctor placed a stethoscope on his chest to listen to the heartbeat. Jill smiled, because she knew how cold the device could feel on bare skin. But Jill became concerned when the doctor reported hearing a heart murmur. The sounds of the heartbeat usually are described as a "lub" followed by a brief pause and then a "dub." Jill's doctor, however, heard another sound, like a faint rush of water in a pipe. Is a Heart Murmur Always a Problem? The sound of a heart murmur may occur as the heart is filling with blood or as it is contracting to send blood to other parts of the body. Sometimes the murmur means there is a defect in the heart or in one of its valves. But many times doctors also find "innocent" heart murmurs, which do not require any special treatment. Innocent murmurs are common in babies and children. The murmurs often disappear as a child gets older, and they are not a sign of heart disease. Fortunately, Jill's baby had an innocent heart murmur. The heart is healthy, but there is a faint murmur during heartbeats. Heart murmurs, however, also can be caused when one or more of the heart's four valves is operating abnormally. Sometimes the valves do not close completely, which may allow blood to leak back from one chamber to another when it should not. Valves also might not open completely, which causes blood to rush through a smaller opening than normal. The murmur also can result from a hole, usually in the wall between the left and right sides of the heart. Some people are born with valve defects or with holes that cause heart murmurs. Others develop a heart murmur after bouts with endocarditis * or rheumatic fever * . Both of these infections may damage heart valves. Anemia and other medical conditions may result in murmurs, even when the valves are perfectly normal. * endocarditis (en-do-kar-DY-tis) refers to inflammation of the lining of the heart, or endocardium (endo-KAR-de-um), usually after an infection settles in a heart valve or in the heart lining. What Does the Doctor Hear and Do? Anatomy of the heart showing heart valves and sinus node. particular sounds, which help doctors make their diagnosis. For example, if a valve fails to close properly between the upper and lower chambers on the heart's left side, doctors may hear a distinctive murmur that will aid in diagnosing the problem. Doctors also can use an echocardiogram to examine the heart and determine a murmur's cause. This test is done with a device that uses sound waves to create an image of the heart. It is similar to the ultrasound machine that creates images of unborn babies inside pregnant women. If the murmur is innocent, nothing special needs to be done. People with innocent heart murmurs can play sports, eat the same foods, and do all the same things as their schoolmates. Murmurs that indicate valve disease may need to be treated with medication or surgery. Such surgery may involve either replacing the valves or closing the hole. Although it is important to find and treat those murmurs caused by valve abnormalities or other medical conditions, most murmurs detected during childhood or adolescence are innocent. These sounds come from the hearts valves "shutting" on the blood inside the heart. The "lub" happens when the blood reaches the mitral and tricuspid valves. The "dub" happens when the blood hits the aortic and pulmonary valves. The U.S. National Heart, Lung, and Blood Institute posts a fact sheet about heart murmurs at its website. American Heart Association National Center, 7272 Greenville Avenue, Dallas, TX 75231. The American Heart Association posts fact sheets about heart murmurs and about how the heart works at its website.